Back in grad school, I first learned of the Fine Structure Constant when a physics prof casually mentioned how some scientists find mystical significance in it. That was a curious thing to mention in a grad-level electromagnetism course, I thought to myself. Later I read what the famous physicist Richard Feynman had to say about this scientific constant, that “all good theoretical physicists put this number up on their wall and worry about it.” Hmmm, what the hell is this thing? After years of science and math education, I’d learned to be skeptical of mystical numerology (don’t get me started on the movie “Pi”). But here I was, grad student in physics, being told smart people are thinking deep thoughts about this grandiose number called the Fine Structure Constant. What the hell is all this about? As a physicist, I found this book especially valuable to read about Pauli, a luminary I only knew until now from various discoveries and theorems that bear his name. (Pauli is most famous for his exclusion principle, but he also predicted the existence of the famously aloof particle the neutrino, was one of the premier architects of quantum theory, and later contributed to renormalization.) 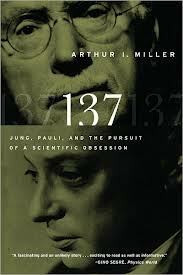 I was impressed with the scientific meat Miller included to the biography of Pauli, which made me feel slightly better about how lost I felt in the alternating chapters that focused on Jung — a reader who is my equivalent in psychology will probably find much of the physics goes over their heads. You might need to be well-versed in both disciplines to really appreciate the biographies of both men equally. Nevertheless, this book was a bit disappointing, and not just because we only get an imperfect view of their relationship (from this book or indeed from any source whatsoever). My disappointment stems from the lack of discussion about the goddamn fine structure constant, the scientific constant that is literally the first word in the title of the book. Yes, it is an important number in science, one that is poorly understood and rates as practically mystical for more than one luminary of physics. Then why does this book barely mention it until we’re 80% of the way through the book? Yes, that’s right — we don’t learn about the fine structure constant until the last chapter. It’s an unquestionably important number, easily deserving of a book-length treatment, so why isn’t it discussed until nearly the end of the book? Personally, I think the cult that has grown around the fine structure constant is overrated. While I won’t second-guess those hard-nosed physicists who worry about it (like the famously practical-minded Richard Feynman), I do find myself with a healthy degree of skepticism regarding the fine structure constant as some mystical kabbalistic number. Complaint numero uno: those who read up about this constant will find a lot of noise about the integer 137 (such as that it’s prime, or supposedly appears in the Kabbalah). But the actual number that appears in the scientific theories isn’t the integer 137 –it’s been measured to be about 137.035999074. That’s close to 137, but hell, the number pi is close to the integer 3, and nobody ever asserts that pi = 3 (aside from some perhaps-apocryphal state legislature somewhere). You’d think that a religion built around a mystical number wouldn’t have to round down to the nearest integer. Readers interested in the connections between hard-nosed science and more ethereal symbolism may really enjoy this book (though the more educated of those readers will already be aware of the collaboration between these two). And there’s much to be fascinated about – the fact that a pillar of science like Pauli took this stuff seriously should make other hard-nosed skeptics in the science community pause before they dismiss it as fantasy. Yes, there may not have ultimately been much that resulted from their collaboration, but if Pauli thought it worthy of his time, shouldn’t the rest of us as well? But this book does itself no service with the fine structure constant bait-and-switch, perhaps unintentionally giving ammunition to those who would scoff at a deep connection between theoretical physics and psychology. For those of us who believe there is something fundamental in common between physical sciences and humanities, this book (like many others) doesn’t quite do the connection justice. 1. You might be wondering why being unitless is such a big deal. After all, I could cook up any number of numerical abominations that combine other unit-laden scientific constants, where all the units cancel. Wouldn’t I then wind up with another unitless constant, that people should worship as a kabbalistic mystical mystery? Yes, but it likely isn’t useful in any scientific description of the world. The fine structure constant has popped up in multiple places in various scientific theories, and so it is 1) unitless, and 2) descriptive of our universe. That’s what makes physicists go ga-ga over it.